Spider-Girl may look like a familiar marquee to Marvel regulars, but I think I can safely assure you that the new series is anything but. Casting aside the costume, numbering, identity and timeline of the under-loved previous series that had so frequently flirted with cancellation, this new number one seems to share only a masthead and a willingness to fight crime with its long-lived predecessor. Set in the present day, Spider-Girl #1 features the debut of former Young Ally Araña in her new getup, swinging through the city on artificial webs during the intermission between classes at Milton Summers High School. Clayton Henry’s artwork is a good way to get a new series off on the right foot. His style is sleeker, smoother and more vividly realistic than the exaggerated, overly stylized work of both Ron Frenz (on Mayday, the previous Spider-Girl) and Mark Brooks (earlier iterations of this character). The shift in artistic discipline is a nice touch, one that reinforces the differences between the new focal point and those two preceding faces. Araña has grown up a bit since the first time we met her, evidenced by her recent appearances in Amazing Spider-Man’s “Grim Hunt” and the short-lived Young Allies series. Henry does a fine job of reflecting that in the character’s physique, demeanor and body language, resulting in a lead that almost feels too mature to still be in high school. Writer Paul Tobin makes an effort to counterbalance that, interspersing a running set of internal monologues throughout the issue in the form of tweets and IMs. That’s not exactly a new trick, but despite a few snags (as in, how is she carrying on a chat at the same time she’s putting the boots to a generic villain in the issue’s opening pages?) and a dangerous proximity to the realm of full-on gimmicks, it does serve a purpose. These little pseudo-interactive thought bubbles are a quick, informal way to introduce new readers to who this new lead character is, what she’s concerned about, and where she’s coming from. Presumably so the story can waste little time in diving right into the thick of its first juicy story arc. Only the drama doesn’t start up immediately, or even imminently. Having efficiently established most of the cast within the first six pages, Anya then spends the next dozen on a carefree stroll through the city, shooting the breeze with Susan Richards. When an unspecified threat to the city forces Sue to cut their lunch date a bit short, our lead does finally dive into the action, although it’s of the generic variety. Stopping purse snatchers, halting a carjacking, that sort of thing, with hints and dashes of tweets and IMs still dropped in at appropriate intervals. It’s a casually paced introduction to the character that slowly builds to ensure something bigger next month. 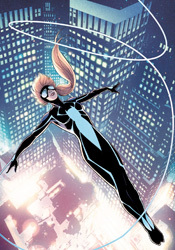 The new Spider-Girl has lots of promise, although it’s still playing with its ultimate intentions held close to the vest. This opening volley is unusually carefree in tone, moving through the story with the same sense of urgency most folks show window-shopping at the mall on a Sunday afternoon. The artwork is gorgeous, thanks in no small part to Chris Sotomayor’s brilliant colors, and the story has spent enough time laying the groundwork for a major shake-up to really have a profound effect. The big question is, will next month’s story stand up and take advantage? As it stands, this debut is decidedly middle-of-the-road. Borrow it.